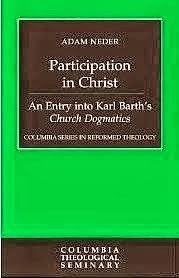 This post continues a series looking at "Participation in Christ (An Entry into Karl Barth's Church Dogmatics)" by Adam Neder. To read other posts in this series, click on a number: 1, 2, 3, 4, 5, 6, 8, 9, 10. ...repudiates, displaces, removes, and pardons the being of sinful humanity and in its place establishes a new and truly human subject who receives the new humanity in faith as an act of pure and obedient gratitude. Justification is the effective sentence that has fallen on Jesus Christ instead of sinful humanity. This verdict abolishes sinful humanity as such, and in Jesus Christ declares, creates, recognizes, and accepts in its place God's new and faithful covenant partner (p52). According to Barth, justification--the replacement of the old human with the new--is an event in Jesus Christ prior to and apart from the faith of those for whom it is accomplished. Christian faith embraces the divine verdict, and in so doing the new humanity with which justification ushers in is realized in the lives of individuals (p53). Of course, if we're honest in looking at ourselves, we don't see fully this new person. Instead, what we see often contradicts the reality of our new humanity found in Jesus Christ. That being so, our faith in Jesus means a corresponding lack of faith in ourselves. "Faith [in Christ] is the gift of the Holy Spirit and the actualization within the Christian of her being as it is in Christ" (p53). Jesus Christ is God's command to make use of the freedom which is ours as his children. Jesus Christ is our sanctification. He is God's direction, God's command to live as his children...to live as those who are in [God's kingdom] already.... (p54). Our response as believers to this aspect of God's grace in Christ is "the obedience of love," which is our acceptance of God's direction in our lives. To respond to God in this way means living out of the fellowship that Christ has created for us between humankind and God. This means living out of the reality of who we actually are in Christ. Like faith, this love is "a free act of pure gratitude" (p54). ...an aspect of the reconciliation of God and humanity in him. No less than faith and love, hope is a form of de facto participation [meaning subjective participation--see p18] in Christ. In fact, vocation is the telos [goal, fulfillment] of justification and sanctification, and therefore "the being of man in Jesus Christ is a being not merely in possession and action but also in expectation." Thus, the new humanity "in its totality is teleologically directed, an eschatolgical being." Jesus Christ is himself God's promise of humanity's future, the revelation that "God has in fact a purpose for man in all of this" (pp54-55, quoting Barth). But what is that purpose? What is the "telos" (the end/goal) toward which this grace of God in Christ is directed? According to Neder, for Barth it is "eternal life," by which he means "life in action"--life with God, who, himself is active. That life is about an, as yet, unrealized, deep fellowship with God. Barth chooses the word "service" to characterize this life in that "service" denotes love-directed action. For Barth, eternal life is "a being in the service of God." It's about living life as God's "obedient partners within the covenant, and therefore in active response to this active ruler" (p55). In this partnership--this eternal life of fellowship with God--we do not cease to be human. We will never be "merged into God.... The future of man in covenant with God...is to be the partner of God and to live as such" (p55). ...neither wishful thinking nor a promise one makes to one's self, because Jesus Christ is God's effective promise of eternal life and therefore hope rests entirely in him. "He Himself as the eternally living God is also the eternally living man," and as such is "the pledge of what we ourselves will be.... In the act of Christian hope the objective becomes subjective... In the act of Christian hope man lives not merely in the factuality of the decision made by God concerning his whole being [justification], but also in the factuality of his own corresponding thoughts and words and works in relation to the service of God" (pp55-56, quoting Barth). It is important to note in closing that Barth sees justification, sanctification and vocation as "events in Jesus Christ." And because Jesus is one, all these aspects are inseparable--of one piece. Said another way, our "new humanity is inseparable from Jesus Christ who is himself the new human." Moreover, our subjective realization of this new humanity through our response of faith, love, and hope is, at every point, the response of a being in relationship (union and communion) with the person of Jesus. Faith, love and hope are thus to be viewed as "modes" of this union and communion--as responses that correspond to the justification, sanctification and vocation, which have been accomplished already in Christ (see pp56-57). So helpful to see all the varied aspects of salvation as being already realized in the person of Jesus. Understanding this with Christ's understanding of this amazing reality only magnifies our love and gratitude to our Savior, leading to more and more communion with Him and an increasing desire to please and follow Him.